A hardened artery is more likely to be damaged. Repeated damage to the inner wall of an artery causes blood clots to form. The clots are called thrombi. They can lead to a further decrease in blood flow. A thrombus sometimes becomes so large that it completely closes off the artery. It could also break into clumps, called emboli. These clumps travel through the bloodstream and lodge in smaller arteries, blocking them off. The tissue supplied by the artery receives no oxygen. It quickly dies. When this occurs in the heart, it is called a heart attack . In the brain, it is called a stroke. Long-term atherosclerosis can also cause arteries to weaken. They may bulge under pressure. This bulge is called an aneurysm. If untreated, they can rupture and bleed. 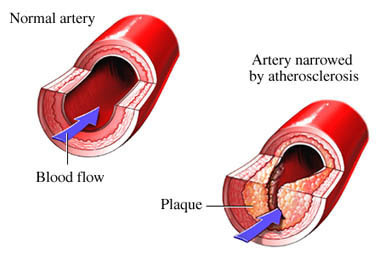 Atherosclerosis is caused by plaque. Plaque is created by high levels of cholesterol and fat in the blood. Scar tissue and calcium from vessel injury can also add to the plaque buildup. The process leading to this may begin in childhood. It takes decades before it causes serious health problems. Eat a healthy diet. It should be low in saturated fat and cholesterol. It should also be rich in whole grains, fruits and vegetables. Maintain a healthy weight. If you are overweight, lose weight. Don't smoke. If you smoke, talk to your doctor about ways to quit. Control any chronic conditions you may have, such as diabetes. If your doctor recommends it, take medication to reduce your risk factors. This may include medication for high blood pressure or high cholesterol. Talk to your doctor about screening tests for coronary artery disease if you have risk factors.